Sometimes you come across a nice Hamilton watch and find out you don't know what model it is. Finding an obscure model is part of the fun of collecting watches. Some watches are extremely rare. At the same time, some watches were never actually made. 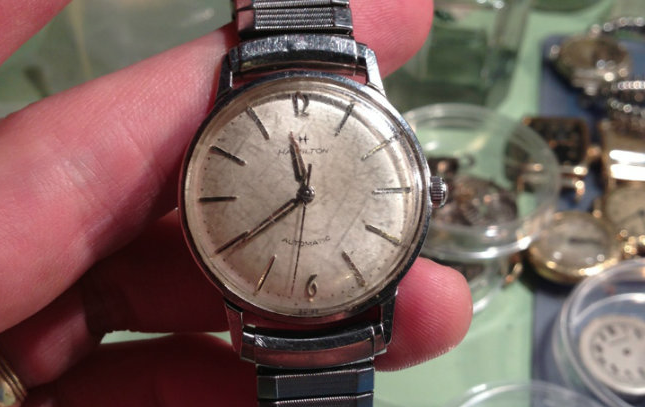 Collectors will often refer to these watches as Frankens, as in Frankenstein, where someone may have re-cased a movement and dial in a non-Hamilton case, or assembled a complete watch using various parts of authentic models. Personally, I think Frankens are interesting since you can come up with some nice looking designs and as long as all the parts are authentic you could de-franken them if you wanted - so no harm done. I'm not a big fan of Hamilton dials and movements in private label cases masquerading as authentic models though - to me those are just spare movements waiting for a new home. That's more common with ladies models than with mens but you will come across both fairly often. There are many Hamilton watches that were not cataloged. Usually they are "presentation watches" provided to employees to mark service anniversaries. In fact, Hamilton had a separate awards division to cater to this important business segment. 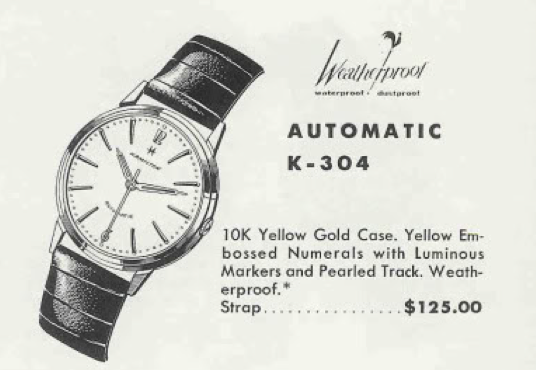 Part of the intention of not cataloguing these watches was because customers did not want their employees to see their "award watch" for sale in their local jewelry store. 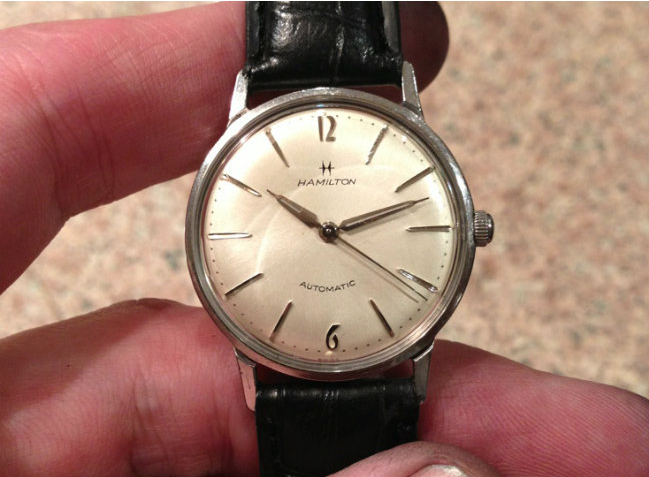 I recently purchased a 1960's Hamilton Automatic in a stainless steel case. As received, it was pretty beat up but running so it made for a nice project watch. 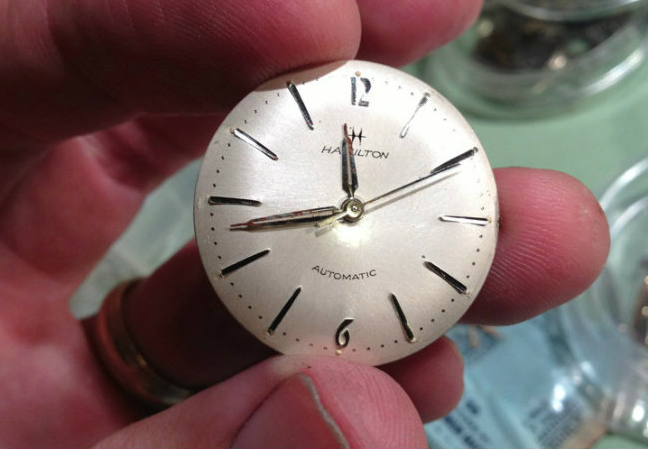 Identifying a Hamilton model is a two-step process... First you note the case material and design details like the shape of the lugs, along with the dial details like the hour markers and printing. The Second step is to go through the myriad catalogs and look for a match. I like to use the "resource center" on an online forum I participate on... check it out by clicking the link below if you need to identify a Hamilton watch. Once I pulled the beat up crystal, I was able to remove the dial and movement. Both were in very nice shape and appear original to my eye. A little bit of rust on the hands was the only distraction. Since the stainless steel cased is marked Hamilton Watch Company, it's an authentic case. Knowing the details of the dial, I then consulted the catalogs. I was able to narrow down my new addition to two possible models, but neither is an exact match. First is this 1960 Automatic K-304. Note the numerals and markers match, as do the hands and the printing of the Hamilton logo and Automatic. Only problem is the case is yellow gold, not stainless steel, and it looks like the case has a step around the circumference where my watch's case is smooth. 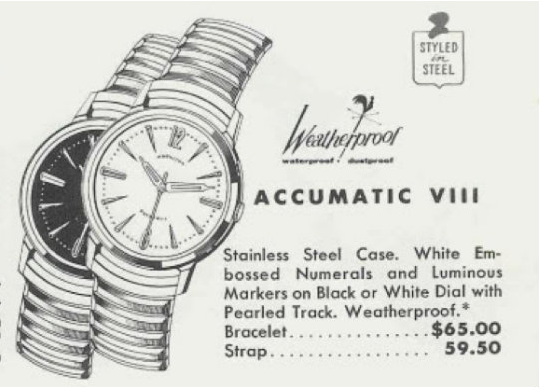 Going into the catalogs a little further, I found the Accumatic VIII. Case shape and material matches, the hands look right. Just the Hamilton logo is a little different and the markers and numerals don't quite agree with my model. So what model is it? I don't know for sure. Sometimes the catalog images were "artistic representations" of the model - so it's possible that it's an Accumatic VIII, but that's a tough call and a long shot. One thing is for sure though. Now that it's all cleaned up with a fresh crystal it looks great. I found a very similar watch in my brother's collection, except the word "AUTOMATIC' is straight across rather than curved and is not all caps. On the resource site it appears closest to a M-89-3 (1964) model although the face looks to be more 'brushed gold', i.e. it is not solid white like the one you are showing. It has the same hour markings as the one you are showing. Can you tell me if it has a screw back or not. I cannot get it to lift up even after lubricants. I would be willing to bet that if you can't open it, then it's a one-piece case and supposed to open through the crystal. If you send me a picture of the front and back I can try to identify it for you. Use the email address that comes up when you click "click here" in the upper right above my picture. I was given this watch as a 21st Birthday present in 1965. it is a very slim watch. Now; I would like to refurbish it, is it possible anyone may be able to identify the model. If so would you have any idea if replacement parts are available anywhere? A picture is worth a thousand words... if you can send me a photo of what you have, I'll try to identify it for you. You can contact me by either using the "clicking here" link above my photo in the upper right or you can contact me through Etsy. Hi I just bought a Hamilton 945 pocket watch 23 jewels. It has the letters cm on the face. Do you know what the cm stands for? No. Does it have a presentation on the case back? Hi HandyDan, I am trying to identify an old Hamilton wristwatch I have and was wondering if you could post your email so I could send you a picture? Don't see the reply function on the website. You can contact me via Etsy or by clicking the link above my photo in the upper right.